Growing up, I never thought about our Father in Heaven having other names. I only knew the name 'God' or Father. As a child, I suppose that was enough, but as the Apostle Paul taught in his letters to the first churches, we can't stay 'baby' Christians, but have to mature into 'adult' Christians and learn more Truths that God has revealed in His Word to us. I never realized there were so many names and each name has a distinct meaning that followers of God should know and appreciate. They are excellent reminders of what our God is like and his majesty. I thank the Holy Spirit for bringing this to my mind while I was mowing the yard! I want to express my thanks to several hubbers for helping to inpire me and encourage me on my walk with the Lord. I want to thank Weathmadehealthy, Dave Matthews, Skye2day, my new friend JinyMarte, and many other believers! I want to give a special thanks to my dear friend, Pastor Pycraft, who really showed me what a true, Bible believing Christian is like and leading me to Salvation through our Lord Jesus Christ. Pastor Pycraft presented this study to our adult Bible study class and wanted to share it with all of you. The credit belongs to him. NOTE: I am going to present this hub in 3 parts since there is a lot of content to this, so hope you will check out the other hubs when published! It is a long study, but believe it will help you learn more about our Father in Heaven and His awesome love for each and every one of us. Our God is unequaled in every way! 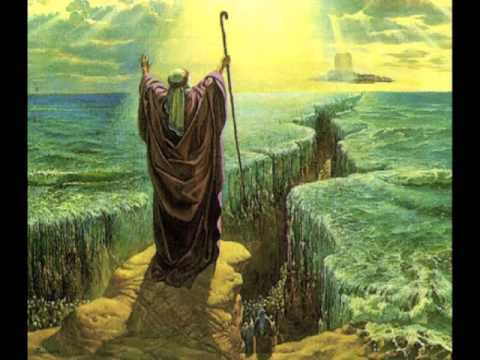 With God leading the Exodus, He parts the Red Sea through Moses, His servant., allowing the Israelites to escape Pharoah's pursuing army and destroying them. The first name of God appears in the Old Testament. Moses, after leading the Israelites out of Egypt after being held captive for so many years, spent 40 years wandering the desert before God led them to the Promised Land. Briefly, He did this to De-Egyptianize the Israelites. Living with the Egyptians for so long, they adopted many of their customs and beliefs. Even after fleeing from Pharoah, the Israelites complained and turned away from God many times. I believe the most dramatic event was when Moses went up to meet God face-to-face and receive the Ten Commandments. God Himself, revealed to Moses that His name was " I AM ". Even Jesus mentions this name of God in the New Testament. I believe this is the name God prefers since He, Himself specifically said His name was 'I AM'. That is good enough for me! :) But, there are other names God is known by. Men and women while on this earth, are to glorify and to enjoy Him. But we can only do this if we know Him. Knowledge of God is more important for the Christian, and the whole world, than all things put together. The names that I write about are the names of God revealed to us in His Holy Word, the Bible. Names in the Old Testament usually described a person's character or some unique quality they possessed. 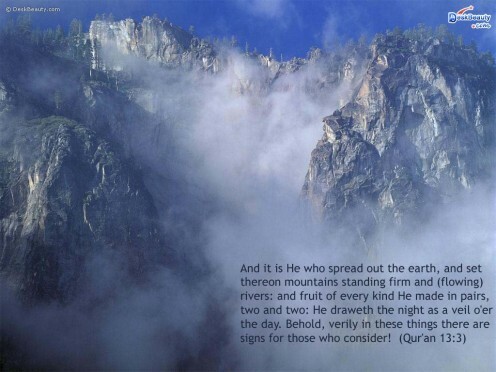 So it is with the names of God. Elohim is used over 30 times in Genesis 1, and a total of 2570 in the Old Testament. God begins in Genesis 1:1 that He is plurality, meaning, more than 1, a trinity. Elohim means "Mighty" or "Strong One" It contains the idea of governing, creative power, and His Omnipotence. It also means "The One Who Keeps Covenants" with men and preserves man for His name's sake. This name is probably more familiar than most. 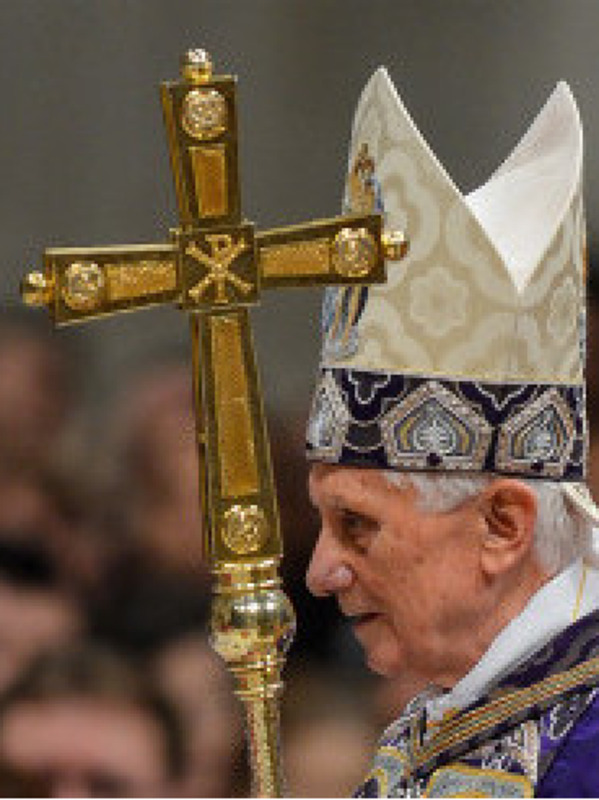 I know in the movie, " Indiana Jones and the Last Crusade, this name of God is mentioned. Jehovah appears in the Bible close to 7000 times. Jehovah comes from the verb 'havah', to be, and means "One who is what He is." "I Am that I Am " is what Jehovah is. (Ex. 3:14-15). One who is self-existent or permanent existence. Jehovah is the Holy One, (Isaiah 6:3). He loves Righteousness and sin grieves and wounds Jehovah (Psalm 95:10). 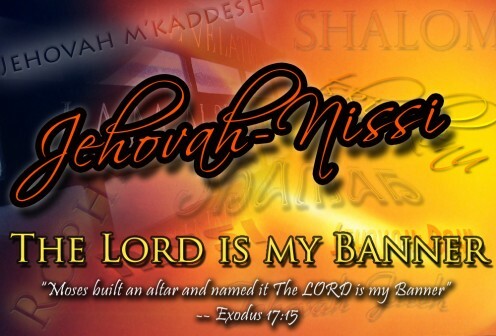 The patriarchs did not know God by the name Jehovah, but by this name meaning God Almighty. In Genesis 17:1-5, Abraham and his wife, Sarah, wanted a son, but since they were well beyond child bearing years, that was unlikely. Producing a son was "as good as dead" (Hebrews 11:12). God had promised Abraham a son back in Genesis 12, but Abraham's faith was beginning to falter at this point. He even takes matters into his own hands and has a son through his maid-servant...producing Ishmael. So God comes and reveals Himself as El-Shaddai. This name of God is associated with creating nature...supporting it always so it will continue. We now learn that El-Shaddai is the who is all bountiful, or fruitful one,...the One Who Maketh Fruitful. 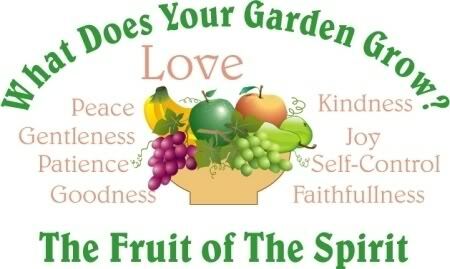 El-Shaddai brings forth fruitfulness in our lives. 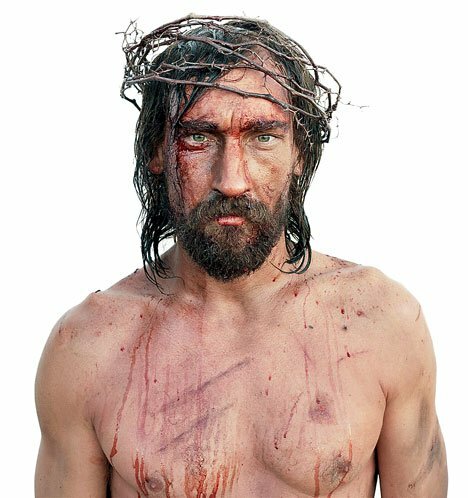 Jesus was beaten severely and then suffered a horrible death on the Cross for our sin. 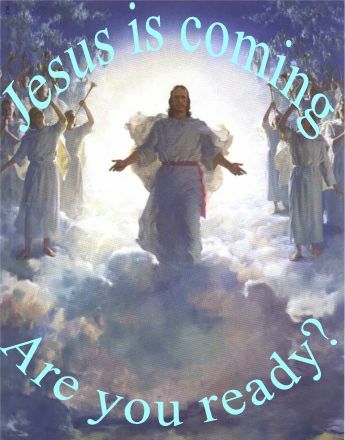 Jesus IS coming again...first to Rapture the Church (believers in Christ) and then again as the Lord of Lord and King of Kings...defeating Satan and creating a new Jerusalem and setting up His Kingdom! Again, Adonai is revealed to Abraham in Gen.15:2. Abraham knew it meant complete ownership and submission. Ownership of a purchased slave and a hired servant was different. 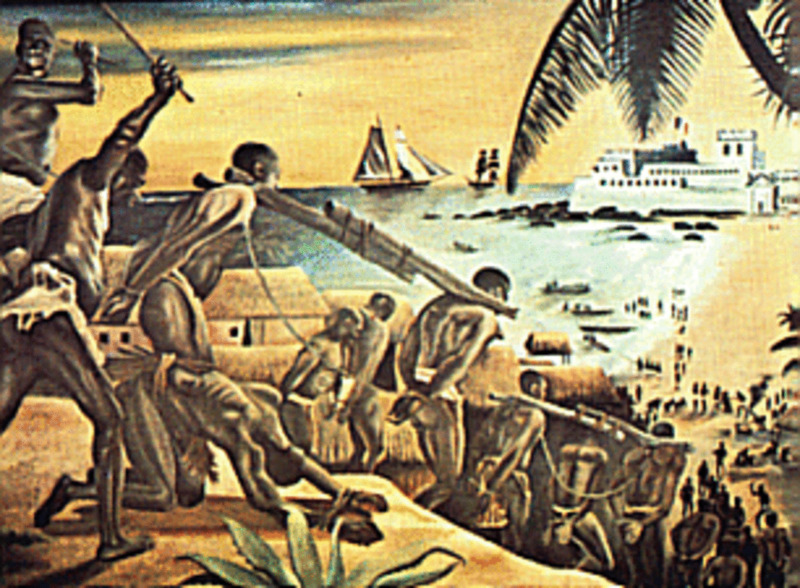 In this case, ownership is referring to the purchased slaves. We, that is believers, are the purchased slaves, or servants of our Lord. Jesus was the greatest example of being a servant, even though He was fully God when on earth. We are purchased by Jesus' death on the Cross and His blood which paid our sin debt in full. Therefore, we are His purchased servants to be used to glorify and honor the Father. We are freed from sin and the destruction of Satan. Jesus made servanthood the highest dignity to God. Personally, being a slave of Christ is far better than a king under Satan!!! This name of God is a compound name. Most of these 'compound' names of God come from some historical Biblical event and teaches that Jehovah is able to meet human needs by some aspect of His character. This name appears when Abraham is facing the greatest trial of his life: the sacrificing of his son Isaac at God's command. 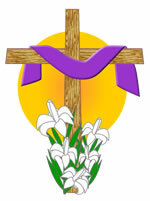 ( Gen 22: 1-12) For those unfamiliar with this event, Abraham, ordered by God, is told to sacrifice his son, Isaac. It is a test by God for obedience and faithfulness but at this point, Abraham doesn't know this. Abraham obeys God, and prepares for the sacrifice, bringing wood to burn, placing Isaac on the alter and getting ready to kill him.. He is just about to kill Isaac when God intervenes and saves Isaac. Instead of sacrificing Isaac, God provides an animal sacrifice instead. Abraham sees that God provided this sheep (ram) and sacrifices it instead of Isaac. Abraham is greatly blessed by God for his obedience! 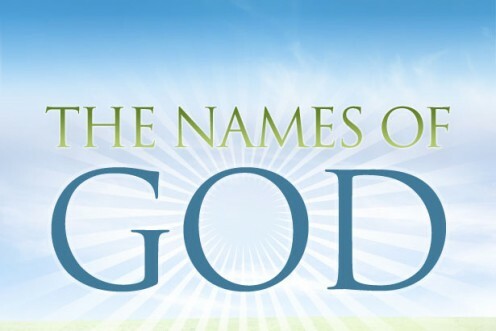 This name of God is very important because of the immediate provision of God! Eventually, God provides the perfect sacrifice, Jesus Christ, for OUR sins. God will provide everything we need, if a true follower of Jesus, to live a Christian life...it is a promise! Jehovah-Rophe reveals that God is able to meet every need that could possibly arise in the life of His people. Jehovah-Rophe shows that mankind needs a Healer, physically (Exodus 15:26), spiritually and morally. (Isaiah 1:4-6). 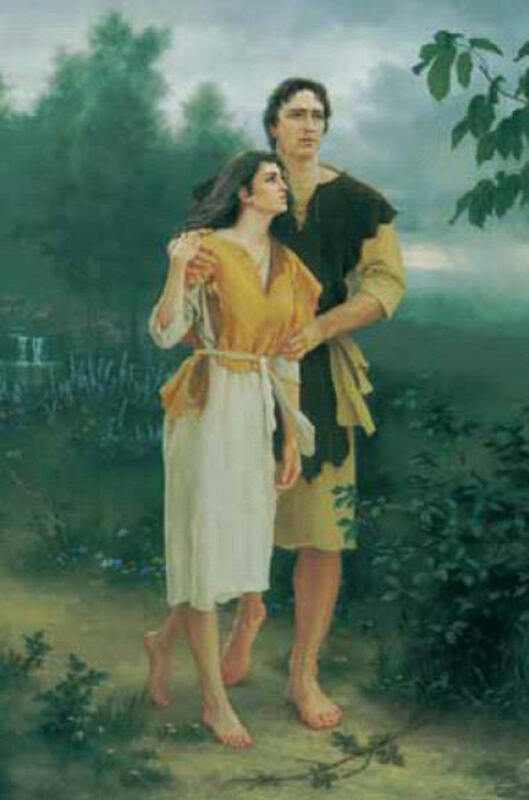 In the Old Testament, Moses prayed to Jehovah to heal Miriam. David recognized the healing power of God. Jehovah brought judgment and then healing to His people. God was mostly concerned with spiritual healing. One important note: Healing is not always in God's Will. Many people find this a stumbling block to believing in a loving God, but God's ways are so above ours and He can see everyone's entire life while we mortals cannot. But I know whatever His Will is, it is for my ultimate good and for his Glory! 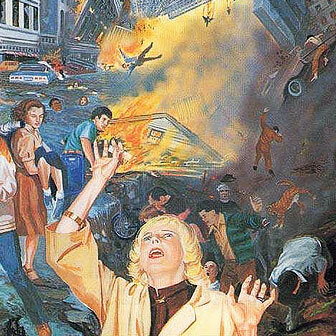 Rendering of the Tribulation Period...God pours out His Wrath on a sinful world. Jehovah-Nisse is revealed when Moses and the fleeing Israelites come to Rephidim. 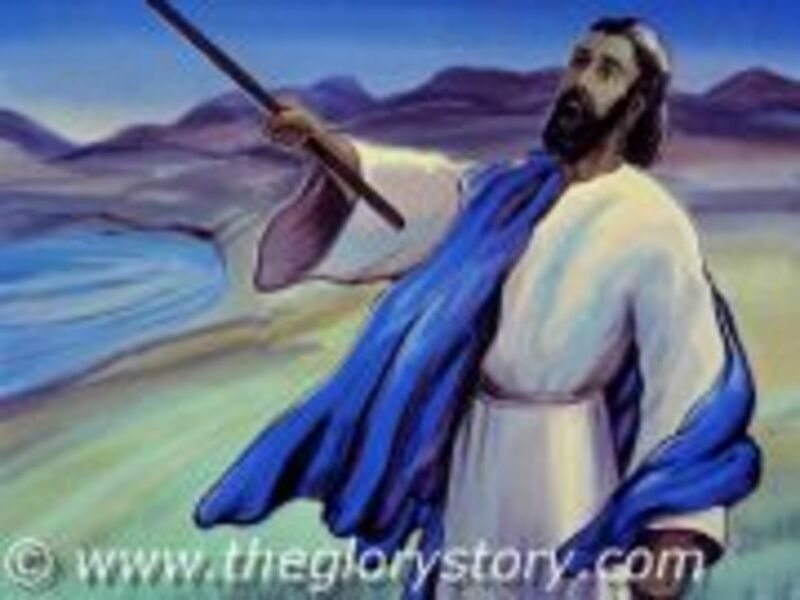 It is here Moses, in anger, strikes a rock with his staff and water gushes forth. This is also the location where the first battle takes place against the enemies of God -- the Amalekites. Moses' staff was God's banner and stood for His cause in the battle. The Israelies looked upon it for comfort and power. It was the symbol and pledge that Jehovah was there with His Power. Without Jehovah-Nisse there is no victory. Israel tried to defeat the Amalekites alone, but did so against God's Will. (Numbers: 14:42-45). They were not victorious. Only when God's strength and presence are with us can we win the battle. Today, the battle believers have is a spiritual one. Our enemy is the Prince of the Air, or Satan who is constantly at battle with us, trying to turn as many as he can against God. Christians are the enemy's main targets, but everyone is being attacked daily by a relentless foe who will do anything to get you to follow his way to eternal death. All Christians are needed to actively and willingly fight in this spiritual war. Jesus died on the Cross for our sin and paid it for all eternity. Here is Jesus in Gethsemene getting comfort as He prepares for His death on the Cross a week later. This name expresses the character of God more accurately than any other. Sanctify is our ultimate goal as a believer. With the help of the Holy Spirit, we can become Holy. Jehovah is apart from and holy above everything in the universe. Holiness is God's fundamental holiness. He is separated from all moral uncleaness. For a believer, it is our Father's desire to restore them, who have been ruined by sin, to a position of holiness. God demands our separation from being with those who would corrupt us. ( II Corinthians 6:17). To be sanctified unto Jehovah means that we participate in the nature, character, and works of Jehovah. He wants us to practice personal holiness. Jesus is our example since He achieved all of this. We are chastened so we might be sanctified unto Him. 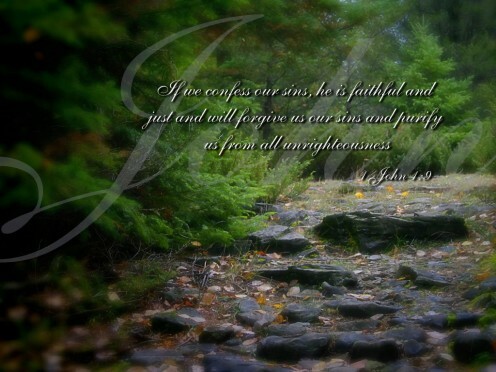 Jesus willingly took our sin upon himself and all that believe in Him are now declared righteous! When the prophet Jeremiah spoke of this prophecy, Judah was about to fall. There was much evil going on: idolatry, oppression, violence, political revolution...(sounds familiar doesn't it?) 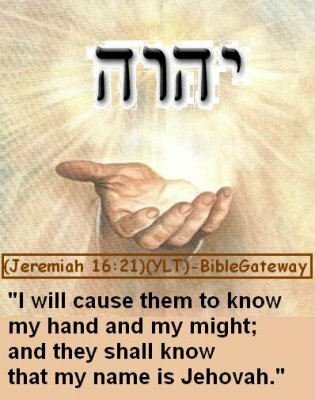 Israel had been defeated and had gone into captivity 100 years before and Judah learned nothing from God's judgment against Israel. God had declared destruction upon Judah! God's patience was up...Judah was corrupt, ungodly, and wicked...turning away from Jehovah-M'Kaddesh. Under these conditions, God gave Jeremiah this prophecy. 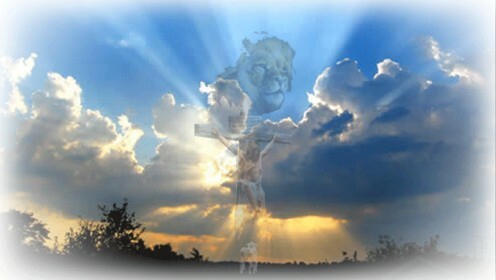 Righteousness is God's holiness demonstrated in His dealings with His creatures. Because God is completely holy and pure, He commands us to conform to His moral perfection. Jehovah is Himself perfect and righteous. No man has ever been righteous. Israel was reminded of their unrighteousness. No matter how good we are, our righteousness is filthy in God's sight. What the Gates of Heaven may be like. This is the conclusion to Part I. When writing this hub, I have learned a lot myself. If you are a Christian, much of this will be understood since you are familiar with the Bible and the events that took place. If not a Christian, I hope this will help you understand how Supreme our Father is, and show you some of His character and attributes. We serve an awesome God! I hope you get into the Word and learn more about God's love and purpose for your life. That is why God inspired his servants on earth to write all of this down. It is for us to start and build a relationship with the Creator of the universe. Accept Jesus as your Lord and Savior, confess and repent of your sins and receive God's free gift of Salvation. 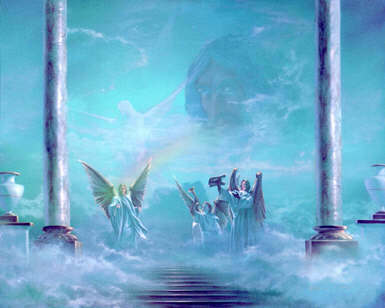 The security of knowing your eternal destiny in Heaven will bring you much comfort in today's world. 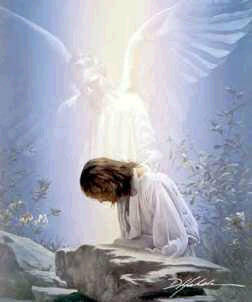 In Heaven you have eternal peace and joy with our Lord! You will NEVER go wrong following our Lord. He loves you completely and wants to give you the very best! You are most welcome for the information and am glad it will help your growth as a child of God. To be honest, I don't thing the vast majority of Christians ever get past the 'baby' stage, and of course, NONE of us will ever reach God's perfect model, His Son Jesus! But, growing to be like Jesus is every Christian's goal and God's plan for us! As long as we are growing and moving towards Christ-likeness, well, that is what counts. Even the great Apostle Paul thought he was far from being what God wanted him to be, and look what he endured. If Paul feels undeserving of praise, even calling himself the chiefest of sinners, well, we all, as he did, just have to continue the 'good fight' and just be in God's Will. Paul always knew his faults, but God, as you know, used him is such mighty ways...if not for Paul, who knows what would have happened in the early days following Jesus's death and resurrection and the beginning of Christ's church! Paul teaches us so much on what we have to do...keeping fighting the fight no matter what the world thinks! Easy...no! Just look at our world and how Christians are hated and reviled...even Jesus knew this was going to happen before He died. Well, Baby Christian...welcome and thank you for taking time to read my hub...I am honored as will be the other brothers and sisters in Christ that you will meet here! Be well and remember....Trust and Obey God and leave all the consequences to Him! 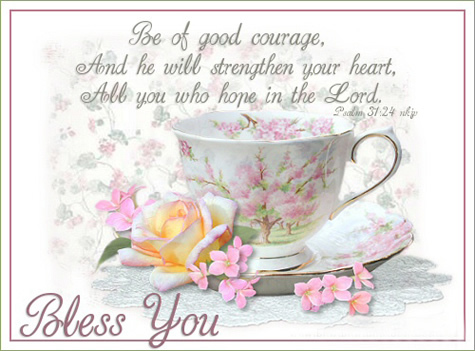 Be well and bless you and yours! Thanks for sharing this information. I am still a baby Christian and I am happy to learn new things each step of the way. Thank you for you comment. God is so supreme that just One name can't describe Him adequately! And this all powerful, Ruler and Creator of not only the Earth and all its creatures, but the entire universe that we can't even begin to comprehend, chose us to be His children and gave us the opportunity to rule with Him in Heaven when we accept His free gift of Salvation. What a God!! AWESOME HUB!!!! This is great! Yes, that is sure true! I hear ya my friend...He always is unexpected, isn't He? Great! Can't wait to read them!! JinnyMarte- Hi there! Glad you came by and took notes. Don't put them away, because I just published Part II and Part III should be up by the weekend! LOL. I am pleased I can share this with you and bring Glory to God at the same time! You know I took my notes!